TERN controllers are designed for embedded systems that require high performance, PC-compatibility, compactness, low power consumption, and high reliability at a low cost. They can be integrated into an OEM product as a processor core component, used to build a smart sensor, or as a node in a distributed microprocessor systems. By building your product around our controllers, time from design to market introduction is reduced, cut development costs, minimize technical risks, and deliver a more reliable product. Where are TERN controllers used? Our complete embedded controller product line includes 586, i386EX, Am188ES, and V25-based 16/32-bit x86 controllers with a wide-range of features useful for embedded/industrial control applications. That includes ADC, DAC, real-time clock, EEPROM, solenoid drivers, power relays, UARTs, opto couplers, LCDs, keypads, PCMCIA, Flash, 9-bit networking, and quadrature decoders. Then there are also the MotionC boards for multi-axis DSP-based motion-control applications. Even with our wide range of available controllers, we know we might not have exactly what you are looking for. If you have specific application requirements in mind, and our listed controllers do not match them exactly, contact us for information about custom board design. After initial prototypes, custom controllers are priced similarly to our current product line. Having just lots of hardware features isn’t enough… our controllers are designed for ease of use. Our boards are programmed in C/C++ through a full-featured Windows-based integrated development environment. It’s a very convenient development platform which includes a remote debugger, making application development a snap. All of TERN’s controllers are designed and manufactured within the USA. This year, more than 30,000 TERN controllers will be installed and used in the United States and more than 20 countries worldwide. 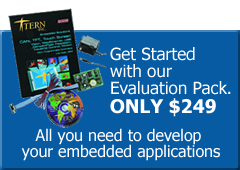 Since 1993, over 3000 customers have made their projects and products succeed with our reliable embedded controllers. TERN’s customers range from large corporations and U.S. governmental agencies to small private firms and engineering consultants. Organizations such as General Motors, Hewlett Packard, Hughes Aircraft, IBM, NASA, and the U.S. Environmental Protection Agency use TERN controllers in their projects. Some recent applications of our controllers include portable instruments, radio remote control and data acquisition, factory automation, packaging machines, robot controls, cellular phone testing, and environmental data recorders. For OEM customers, our greatest interest is in helping you complete your prototype as quickly and as easily as possible. To help you in this task, we offer custom software design that allows you to have a working initial application within a few weeks. Let us help you move into production quickly. Use our Live Chat option by clicking the image-button located on the left sidebar. You can browse our website for for quick answers, manuals and technical articles. Visit our message board to get help and tips from fellow TERN customers.